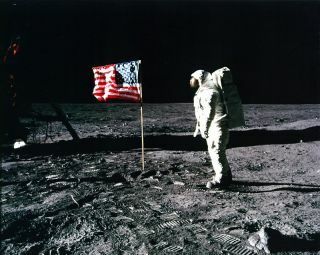 Apollo 11 astronaut Buzz Aldrin poses with the American flag on the surface of the moon in July 1969. Giving NASA a strong dose of stability and direction would help sustain United States leadership in spaceflight and exploration for decades to come, a new report advises. NASA has been pulled in too many directions for too long, according to the report, which was released today (Dec. 4) by the nonprofit Space Foundation. The agency needs to set a unified, long-term vision and be able to work toward it no matter which way the winds of power are blowing in Washington, D.C.
"We think that if you've got your purpose clear, then it becomes easier for you to sit down and detail a 10-year plan and a 30-year plan that you stick to and revisit and revise as you make discoveries," said Space Foundation CEO Elliot Pulham. Neil Armstrong's famous first steps on the lunar surface were made possible by a laserlike, agencywide focus that just doesn't exist at NASA today, according to the report. "As the space program has evolved, we have witnessed frequent redirection and constantly shifting priorities at NASA, mixed signals from Congress and the administration, organizational conflicts and the lack of a singular purpose, resulting in a space agency without a clear, stable direction," the report states. "This report does not advocate for space settlement or colonization; rather, it is focused on expanding the human sphere of influence," the authors write. "For example, much of the ocean floor is part of the human sphere of influence through the use of robotics, even if it is seldom visited by humans. One way or another, humans should seek to sustain a presence elsewhere in the solar system." Pioneering has four phases, as laid out in the report: access (the ability to get to and from a destination); exploration; utilization; and transition (handing activities off when appropriate to other government agencies or to the private sector). The report stops short of prescribing a particular sequence of destinations. "We did not want to be in the business of specifying, 'Look, we've got to go to the moon first, we've got to go to Mars first, we've got to do this or that,'" Pulham told SPACE.com. "Our view is that, if you're pioneering, then you're going to first of all take a much broader survey of the whole solar system, and then the destinations and the order of battle will become pretty clear." The report further recommends that NASA draw up a 30-year plan to map out broad objectives, and a sequence of 10-year plans that set specific dates and commitments within the larger pioneering framework. These plans would be submitted to Congress for approval every five years. NASA's plans should be vetted by a newly created, 12-person NASA Commission, the report continues. The commission would consist of the space agency chief, three presidential appointees and four members each from the House and Senate. Implementing a long-term vision requires greater stability in NASA leadership and funding, according to the "Pioneering" report. So the NASA administrator should be appointed to a renewable five-year term (rather than serve at the pleasure of the president), and Congress should create a revolving fund the agency can draw from to finance its operations (instead of simply giving NASA a rigid top-line budget every year). "We think that NASA's budget needs to be able to fluctuate with the work that they need to do," Pulham said. "The budget needs to track with the program. So we recommended things like multi-year procurement authorizations — something that the Pentagon and other agencies do very successfully." Pulham does not necessarily expect the report's recommendations to be embraced fully and implemented immediately. But he does hope "Pioneering" gets people talking. "I'm optimistic that this is going to make a positive contribution to the national dialogue," Pulham said. "If it can serve as nothing more than a point to kick off a national dialogue that does have some result, then we're going to feel really great about what we've done."